In the mid 1970’s, researchers wanted to take advantage of what was then an exciting new technology, the Computerized Axial Tomography Scanner later christened the CAT Scan, to capture images of living heart muscle in order to better study it. The problem was that conventional Scanners had many moving parts including an X-ray gun that had to rotate around the patient while taking each scan. This required several seconds to take one image. The heart, however, is not very cooperative about holding still to have its picture taken. So to speed things up they developed a way to quickly generate the needed x-rays without physically rotating an X-ray gun around the patient. They did so by replacing the familiar doughnut shaped apparatus that surrounds the patient in a normal CAT scanner with a large tungsten metal ring. 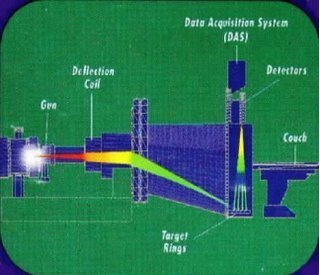 Then, exposing this ring to a high-energy beam of electrons, the tungsten gives off the needed x-rays to create the picture. The electron beam is similar to that created in every TV picture tube only on a much larger scale. It is focused and quickly swept around the ring, using electromagnets in much the same way a single electron beam is rapidly swept across our television screens to cover the whole surface many times each second. The rest of the machine is pretty much the same as a conventional CAT Scanner, but this change in how X-rays are created and handled results in a very fast machine that can take a complex CAT scan image in 1/100 of a second! This is ample time to get a clear picture of the heart if the timing is right. Timing is achieved by simply taking the picture between heartbeats, using simple EKG electrodes placed on the patient's arms and legs to tell the machine when to take the picture. Once this wonderful machine was actually built, researchers noticed that certain hearts had a calcium buildup in the coronary arteries and that other hearts did not. At the time, our understanding of how heart attacks occurred was so flawed that the potential value of this observation was mostly ignored, except by a few very tough individuals who have withstood the skepticism and sometimes ridicule of their colleagues to pursue the possibility of using this information. As our understanding of heart disease has progressed, it has become clear that the more calcium a person has in their heart vessels, the more plaque they have. Even though most plaque does not contain much calcium (only about 20% of plaques do) and the plaques that rupture may indeed be the ones without much calcium, the percentage of total plaque that contains calcium remains fairly constant, so if a person’s calcium plaque-load doubles, so does his total plaque load. 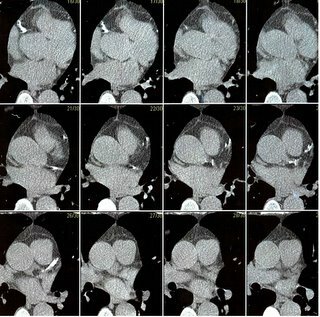 Also, if a person has no calcium seen in his arteries, research has proven that his total plaque load is so small that he’s exceedingly unlikely to have a heart attack. This technology has been tested on over 60,000 individuals over more than two decades to study how well it can predict the “future” of these people. And the last few years have seen many publications based on the information from this decade of observation and study. The good news is that the technology works. The ability of the ultra high-speed CAT scan, called a HeartScan, to quantify the amount of coronary plaque correlates with an accurate prediction of the likelihood of a heart attack or sudden death. I have personally known about this technology for about twelve years, yet I did not start using it until 1999. The reasons I avoided this technology were two-fold. First, the ability to take a picture of a problem did not in any way suggest that the information would predict either safety or danger in terms of a patient's risk for a heart attack. I was concerned that a “clean” picture could give a false sense of confidence to some people and steer them away from life-saving treatments of known risk factors. I had already met people who had chosen to stop taking cholesterol-lowering medication because of a low HeartScan score. Second, a high score (lot's of artery disease) was not going to change how I treated that patient. I was already treating all the risk factors I knew how to treat in each patient, and I felt that a picture showing lots of heart disease would add nothing but anxiety to the situation. But things have changed. Recent studies have put to rest concerns I had about people with no visible heart disease dying from "invisible" plaque. They don't. Of course this is an over-simplification but the ability of the scan to predict people who would not have heart attacks in the near future has been very reassuring. As for high HeartScan scores, they now greatly affect how I treat my patients. We are in a time of explosive discovery about the details of heart disease and stroke. The presence of diseased coronary arteries in an otherwise healthy appearing adult is to me like a smoking gun that must lead to a manhunt for the cause(s). Dozens of new risk factors and their respective treatments have entered the game and we can not only do more for each patient, but we can direct our treatments much more specifically once we know who is and who isn't forming large amounts of coronary plaque. The HeartScan is a very easy test, requiring five to ten minutes. There are no needles involved or any specific preparations. It doesn't even require disrobing. The person lies on the CAT scan table and four electrodes are connected to his or her limbs so that the machine can take its pictures in-between heartbeats. The study is over and done with in a matter of moments. The results are often available immediately and sometimes discussed with the patient by the technician at the study center. The results are then sent to the patient’s physician and can be used along with other information to make very meaningful recommendations for the prevention of cardiac disease. This information wouldn’t be so important if we didn’t have so many safe, easy and effective ways to reverse this hardening of the arteries. But we do. So it behooves all of us in our middle years to get our heads out of the sand and find out where we stand with the nation’s #1 killer and then, if necessary, take steps to thwart that killer. Every year doctors learn about new risk factors that can be measured in a person's blood or by their history that can suggest an increased risk for heart attack. On the other hand, it remains unknown for each new risk factor whether intervention to alter it has any long-term effects for the individual. Also, it becomes impossible to keep up with all the testing that can be done on an individual in order to find a hidden risk factor lurking in their body. Since new risk factors are being discovered so frequently and our ability to effectively manage them is uncertain at the present time, it makes a great deal of sense to actually look at a person’s heart and see if they are developing plaque and, if indeed they are, to then heighten our search for reversible causes. On the other hand if a person has some numbers that may be disturbing such as an elevated cholesterol or more obscurely, an elevated fibrinogen level or C-reactive protein, two of the new and poorly understood risk factors, a negative heart scan can help us to put the person's mind at ease and allow us to simply follow that person without exposing them to needless restrictions, medications, etc. At the time of this writing, the worst scan result (highest plaque score) of any of my patients is of a personal friend, a 66 year old man who has normal cholesterol, blood pressure, blood sugar, and who has never smoked. His exercise treadmill test with special imaging is completely normal. His scan is shown in part above. The white areas represent calcified coronary artery disease. Without this scan, nobody would have ever suspected that his hardening of the arteries was in the red-alert range. We went on to look for less mainstream risk factors and found two severe problems that can explain the disease and can now be corrected. He and I will continue to follow his heart disease over the coming years to be sure our treatments are working and to stay abreast of newly discovered risk factors that may be involved in his problem. Without this scanner, I would not know on whom I should be focusing such intense attention. The information it provides is truly life-saving, yet despite the fact that it’s been around for 20 years and the studies have proven that it works, it will still take doctors and patients another decade to fully realize that it is no longer “new” or “experimental”. Currently “unofficial” recommendations are to scan all men over the age of 40 and all woman over the age of 50 if they have at least one other risk factor. I personally encourage my patients to get scanned whether they have any other risk factors or not. The HeartScan is not available in every city in the United States. One company that makes them is GE Imatron and it hosts a web site (http://www.geimatron.com) with current locations and more information. I live in Oregon and at the time of this writing there is only one scanner in my state. Prior to its arrival dozens of my patients made the trip to neighboring California or Nevada to have the test and they were all very glad they did. Whether they experienced relief from a negative test or had to face the fact that their arteries needed help, they are grateful to know either way since problems can now be treated. HeartScan costs about $450.00 and it is not a test that is usually paid for by most insurance companies at this time (much the way mammograms, pap smears and PSA tests for prostate cancers weren’t paid for in years past). While we wait for this test to be considered “the standard of care” in the insurance industry, while doctors remain ignorant of the few simple facts I’ve presented here and while patients steadfastly refuse to invest $450.00 of their money into their own health for the irrational reasons discussed in earlier chapters, thousands more people will die needlessly as a result, moms and dads, husbands and wives who could have been identified, treated and saved if they had made the small effort to get this scan. Don’t be one of them. What about the more established practice of identifying indirect risk factors for heart disease such as high cholesterol, high blood pressure, diabetes, smoking, family history, etc? How do we integrate all these things into avoiding heart disease? HeartScan does not replace, but rather augments conventional screening for cardiac risk factors. It helps us to identify people, like my friend who would be missed by conventional screening of blood work, family history, blood pressure, etc. It helps determine for which patients we need to “dig deeper” to identify the cause of the silent, hidden heart disease it finds. It also helps point out which patients with known risk factors we need to treat with the most aggressive therapies and which we can try to treat without medications. We clearly need to stay on top of conventional and newly emerging risk factors to make good choices for health and survival. Let’s start in the next chapter with my favorite, Serum Cholesterol. Since I personally have a very high cholesterol whenever its left untreated, I take a great deal of pleasure in the fact that modern medication now gives me a cholesterol lower than 95% of men my age and that I have coronary arteries devoid of dangerous cholesterol plaque. Having worried about my "genetically" high cholesterol for years, I can’t help but now feel a bit like the kid who finally turned and confronted a longstanding bully knocking him flat out of my life once and for all. The link in this article doesn't work.